Just as with the previous seeding tables I’ve produced, here’s one for the upcoming WSC mass start. Again, this ignores issues of who might actually start the race (e.g. Astrid Jacobsen makes my list here) and some folks who may only have done a small number of races will be excluded. To give you a sense of the model’s actual relative predictions, here’s a simple dotplot with the output for the top 30 seeds. I’ve omitted the units on the x axis, since they are essentially meaningless. So, what I mean by “ignore the units on the x axis” is simply to just qualitatively read the gaps between the skiers. 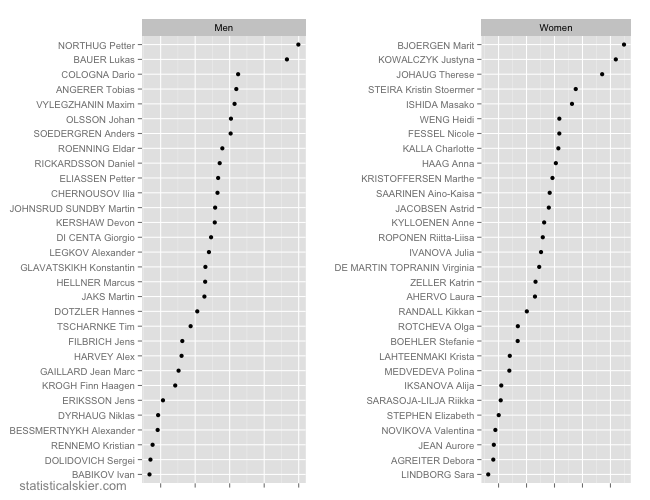 So the model thinks that Northug and Bauer are somewhat more strongly favored that everyone else, and then things decay relatively evenly after that. On the other hand, the model doesn’t think that Bjoergen is a slam dunk, which I think is sort of questionable. Part of the issue here may be the simple paucity of data on long mass start classic races. It’s just not an event that’s done that frequently anymore. But generally, the model likes Marit, Kowalcayk and Johaug more than anyone else (and in that order), which means that the model is at least passing the most basic sanity check. I suspect that Liz Stephen is being penalized somewhat for the difference between her skating and classic results, and Kikkan is being penalized somewhat for the difference between her results in shorter versus longer events. Kris Freeman and Noah Hoffman weren’t terribly close to the top 30 here, as the model put them in 40th and 41st respectively, just in front of Andrew Newell, actually, in 46th. Posted by Joran on Tuesday, February 26, 2013, at 6:00 am. Filed under Analysis, Cross Country, World Ski Championships. Tagged classic, Distance, mass start, men, seeding, women, WSC. Follow any responses to this post with its comments RSS feed. You can post a comment or trackback from your blog.